The solo song recital was introduced into England only in the 1880s, when it was pioneered by the German singers Raimund von Zur Mühlen and George Henschel. Thus the full impact of Schubert’s and Schumann’s song cycles on the British public came only at the end of the nineteenth century, long after that of the ‘royalty’ ballad, whose middle- or lowbrow appeal had given rise to song-plugging ‘ballad concerts’ of a popular nature from the 1860s onwards. Further kinds of song presentation were current: there was the vocal quartet (such as the Hutchinson family), whose members might sing solos and duets as well as ensembles, sometimes linked by piano interludes (Liza Lehmann wrote In a Persian Garden to such a prescription in 1896); it also needs to be remembered that throughout the nineteenth century instrumental works in orchestral and chamber concerts were interspersed with vocal items such as songs with orchestral accompaniment. Against this background Somervell’s narrative song-cycles must be seen as pioneering works. His first, Cycle of Songs from Tennyson’s ‘Maud’, published in 1898 and performed by Lawrence Rea at the Salle Érard, London, on 2 November 1899, was to be his biggest and boldest, condensing a complex story, already present in Tennyson’s poem, into thirteen songs. His second was A Shropshire Lad, published in 1904 and performed by Harry Plunket Greene at the Aeolian Hall on 3 February 1905. This comprises the earliest traceable Housman settings, ten songs ordered so as again to suggest a story, Somervell knitting the circumstances and emotions of Housman’s protagonist into a narrative that builds on them sensibly and plausibly enough. His two later cycles were both to poems by Browning. In James Lee’s Wife for contralto and orchestra, written for Marie Brema in 1906, the poet’s narrative sequence of nine poems was reduced to five, whereas in A Broken Arc for baritone and piano, published in 1923, eight short poems from various parts of Browning’s output were put into a sequence that again implied a narrative. All four stories reach a tragic climax followed by a cathartic ending (in this Somervell goes against Browning in James Lee’s Wife, leaving out his last two poems with their bitter conclusion). They are full-blooded, highly serious romantic essays in dramatic lyricism, looking square in the face the archetypal issues of love and death with a Victorian earnestness that ranges from the sentimentally eloquent to the macabre. Unlike Schubert but like Schumann and Beethoven, in all four song-cycles Somervell brings to his aid resources of musical cross-reference: in A Shropshire Lad these are limited to the recall of the music of the first song throughout the ninth, whereas in each of the other three use is made of several recurrent thematic motives. Even leaving aside the hundreds of individual and casual settings of Tennyson that had already accumulated, Somervell was not the first British composer to seek in him poetic material for a unified romantic song-cycle along Austro-German lines. Sullivan had persuaded Tennyson to write the verses of The Window for him in 1866, but they were hopelessly feeble, as the poet himself seemed to recognise in his preface; so was Sullivan’s music. Liza Lehmann’s more serious contribution, her continuous setting of sections of In Memoriam, published in 1899, must have been written around the same time as Somervell’s Maud, but Maud is the more ambitious of the two, as well as being far superior musically. Tennyson’s monodrama Maud, which had appeared in 1855, was a late product, and one of the few successes, of the so-called Spasmodic School, an ill-conceived poetic movement of the 1830s and ’40s whose practitioners included such names as Philip James Bailey, Sydney Dobell and Alexander Smith. They were belated romantics, deliberately courting unbalanced inspiration, blind subjectivity and even incoherence in their works. Self-expression and self-dramatisation were exploited to the extent that Tennyson’s guilt-ridden and neurasthenic yet proud lover in Maud, with his vacillations, impetuosity and lapses into madness, is typical. Tennyson’s narrative consists of twenty-eight poems, cast in the first person singular in a great variety of lengths, metres and forms. The first part, encompassing the wooing of Maud and culminating in Poem XXII, the ecstatic ‘Come into the garden, Maud’, is the longest. The five poems of Part II look back on the catastrophe that has intervened, and Part III consists of one final poem developing the theme of redemption. The language is overwrought, and events are often difficult to piece together from the disordered references to them, yet Somervell just manages to retain some narrative continuity despite having had to restrict his settings often to certain stanzas or even single stanzas of the thirteen poems he chooses. He jettisons much of the incidental detail, and we have to consult Tennyson to discover why the hero says ‘I hate the dreadful hollow behind the little wood’ (No 1); it is because his father committed suicide there, having been financially ruined in a business speculation of his partner and old friend, now owner of the nearby Hall and returning rich from abroad with his family. The hero has heard his daughter Maud singing in No 2 (‘A voice by the cedar tree’), and in No 3 (‘She came to the village church’) their eyes have met during divine service. Tennyson gives some space to the obstacle of a rival suitor favoured by Maud’s brother – politics come into it, since the brother is a prospective Member of Parliament and the suitor a nouveau riche ennobled grandson of a miner – but Somervell uses more generalised portions of the text and concentrates on building up his crescendo of romantic infatuation through his next six songs (of which No 6, ‘Maud has a garden’, was included only in the second edition of 1907). In No 10, ‘The fault was mine’, we need to know that the hero is far away, having fled abroad after killing Maud’s brother in a duel occasioned by the discovery of their tryst in the garden after the Hall ball. In No 11 (‘Dead, long dead’, a fine ‘maniac’ song) he is out of his right mind and believes that he is dead and insufficiently deeply buried. Out of this symbolic burial comes renewal, and in the last two songs a martial resolution is reached, for we are to understand that the hero joins an army and hence can soon hope to join Maud, who is by now dead herself, in heaven. The story implied in A Shropshire Lad is quite similar. In No 1 (‘Loveliest of trees’) the hero, aged twenty, marvels at the beauty of spring and feels the stirrings of romance. Already in No 2, though, a year or two later (‘When I was one-and-twenty’), he rues having given away his heart, a theme pursued and deepened in No 3 (‘There pass the careless people’), possibly because (as is implied by Housman in ‘Bredon Hill’, No 4) there has been a guilty outcome and his girlfriend has died in childbirth. Left alone on the hilltop the following summer, he can no longer resist the call to arms and action in far-off lands (No 5, ‘The street sounds to the soldiers’ tread’ and No 6 ‘On the idle hill of summer’), and in No 7 (‘White in the moon’), like Schubert’s winter wanderer he is leaving home secretly in the middle of the night. Drink helps him to forget (No 8, ‘Think no more, lad’), but later when he is at the point of death in some foreign field he is transfixed with memories of the cherry orchard of No 1 (No 9, ‘Into my heart’). All that remains in the final song is for ‘The lads that will die in their glory and never be old’ to be lauded. In both these cycles Somervell’s music, generally not far from Brahms or Schumann in style, is simple enough to be self-explanatory, but it is worth drawing attention to some of his illustrative felicities. The sentimental atmosphere of a village church service with its organ voluntary is perfectly captured in No 3 of Maud, as is the offstage dance music several songs later in ‘Come into the garden, Maud’ (Somervell’s depiction of a waltz here takes its cue from ‘Das ist ein Flöten und Geigen’ in Schumann’s Dichterliebe). As befits the poetry, such depictions are more naive in A Shropshire Lad, in which there is a greater emphasis on primal melody; the bells and funeral procession in ‘Bredon Hill’, the march past and distant drumming in the following two songs, the carousing in ‘Think no more, lad’ and the rustic fairground music in ‘The lads in their hundreds’ are all represented without usurping the place of simple tunes, which are what this cycle thrives on. Maud, as has been mentioned earlier, also makes use of recurrent musical motives. There are five significant ones: a cascade of diminished-seventh and dominant-ninth figurations that opens the first song and suggests death; the tune of Maud’s ‘passionate ballad gallant and gay’ in the second song; the sighs of contentment that close ‘I have led her home’ and are later transformed into dying gasps and choking cries of anguish; a funereal falling scale passage dominating ‘The fault was mine’ and later developing into an ostinato and inverting itself to become a symbol of hope; and a chorale-like redemption motive in a dactylic rhythm, not unlike that of Liszt’s Piano Sonata. All of these recur or undergo transformation in the last three songs, to fulfil both the musical structure and the metaphysical purpose of the narrative. Somervell’s song-cycles must be ranked among the most significant musical fruits of the Victorian age. No other composer represented Tennyson (or Browning) so thoroughly and faithfully; and few if any even of literary figures could have claimed credit for spotting the potential resonance of Housman’s poems as early as 1904, eight years after they were first published. 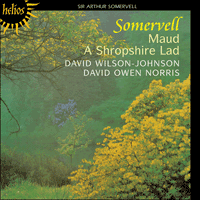 Butterworth, Vaughan Williams, Gurney, Ireland and countless others were soon to lend Housman much wider musical ramifications, but there remains a primacy in Somervell’s melodic response that later settings cannot obliterate.